Old Greenwood is a true gem of a course! This world-class Jack Nicklaus Signature Golf Course was rated among the “10 Best New Public-Access Courses in the Country” by Golf Magazine and placed fourth among “America’s Finest New Upscale Public Courses” by Golf Digest magazine. There is nothing that quite compares to Old Greenwood’s acres of immaculate greens interspersed with stately pines and blue sagebrush. The 18-hole course is simply stunning with the natural landscape incorporated into the course. Old Greenwood is also surrounded by a planned community with gorgeous homes. If you have young golfers or want to improve your own game, sign up for The Golf Academy at Old Greenwood. It offers junior camps, private and group lessons, and customized corporate sessions. Book a two-course special at Old Greenwood and its sister course, The Golf Club at Gray’s Crossing, which is right across the street. Receive a warm welcome from the friendly staff, check out the golf shop, relax in the clubhouse, and finish off your day at the Terrace Grill. Any way you look at it, Old Greenwood offers an excellent golfing experience. Let the professionals at Old Greenwood Golf Course host your next big special event, banquet or wedding. Choose from three wonderful venues in the Truckee/North Lake Tahoe area which include Alpine Club, PJ’s at Gray’s Crossing and Schaffer’s Camp. 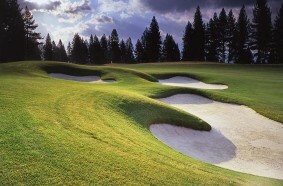 The Sierra Mountains offers a beautiful serene setting and nearby Lake Tahoe an endless outdoor playground for guests.